Toronto ( /təˈrɒntoʊ/ tə-RON-toh) is the capital city of the province of Ontario and the largest city in Canada by population, with 2,731,571 residents in 2016. Also in 2016, the Toronto census metropolitan area (CMA), the majority of which is within the Greater Toronto Area (GTA), had a population of 5,928,040, making it Canada’s most populous CMA. Toronto is the anchor of an urban agglomeration, known as the Golden Horseshoe, in Southern Ontario on the northwestern shore of Lake Ontario. A global city, Toronto is a centre of business, finance, arts, and culture, and is recognized as one of the most multicultural and cosmopolitan cities in the world. When Europeans first arrived at the site of present-day Toronto, the vicinity was inhabited by the Iroquois, who had displaced the Wyandot (Huron) people, occupants of the region for centuries before c. 1500. The name Toronto is likely derived from the Iroquois word tkaronto, meaning "place where trees stand in the water". This refers to the northern end of what is now Lake Simcoe, where the Huron had planted tree saplings to corral fish. However, the word "Toronto", meaning "plenty" also appears in a French lexicon of the Huron language in 1632, and on French maps referring to various locations, including Georgian Bay, Lake Simcoe, and several rivers. A portage route from Lake Ontario to Lake Huron running through this point, the Toronto Carrying-Place Trail, led to widespread use of the name. In the 1660s, the Iroquois established two villages within what is today Toronto, Ganatsekwyagon on the banks of the Rouge River and Teiaiagon on the banks of the Humber River. By 1701, the Mississaugas had displaced the Iroquois, who abandoned the Toronto area at the end of the Beaver Wars. In the 17th century, the area was a crucial point for travel, with the Humber and Rouge River providing a shortcut to the upper Great Lakes. These routes were known as the Toronto Passage. French traders founded Fort Rouillé on the current Exhibition grounds in 1750, but abandoned it in 1759 due to the turbulence of the Seven Years' War. During the American Revolutionary War, the region saw an influx of British settlers as United Empire Loyalists fled for the British-controlled lands north of Lake Ontario. The new province of Upper Canada was being created and needed a capital. In 1787, the British Lord Dorchester arranged for the Toronto Purchase with the Mississaugas of the New Credit First Nation, thereby securing more than a quarter of a million acres (1000 km2) of land in the Toronto area. Dorchester intended the location to be named Toronto. In 1813, as part of the War of 1812, the Battle of York ended in the town's capture and plunder by U.S. forces. The surrender of the town was negotiated by John Strachan. American soldiers destroyed much of the garrison and set fire to the parliament buildings during their five-day occupation. The sacking of York was a primary motivation for the Burning of Washington by British troops later in the war. Toronto's population of only 9,000 included escaped African American slaves, some of whom were brought by the Loyalists, including Mohawk leader Joseph Brant. Torontonians integrated people of colour into their society. In the 1840s, an eating house at Frederick and King Streets, a place of mercantile prosperity in early Toronto, was operated by a man of colour named Bloxom. Slavery was banned outright in Upper Canada (and throughout the British Empire) in 1834. As a major destination for immigrants to Canada, the city grew rapidly through the remainder of the 19th century. The first significant population influx occurred when the Great Irish Famine brought a large number of Irish to the city, some of them transient, and most of them Catholic. By 1851, the Irish-born population had become the largest single ethnic group in the city. Smaller numbers of Protestant Irish immigrants were welcomed by the existing Scottish and English population, giving the Orange Order significant and long-lasting influence over Toronto society. For brief periods Toronto was twice the capital of the united Province of Canada: first from 1849 to 1852, following unrest in Montreal, and later 1856–1858, after which Quebec became the capital until 1866 (one year before Canadian Confederation). Since then, the capital of Canada has remained Ottawa, Ontario. Toronto became the capital of the province of Ontario after its official creation in 1867, the seat of government located at the Ontario Legislature located at Queen's Park. Because of its provincial capital status, the city was also the location of Government House, the residence of the viceregal representative of the Crown in right of Ontario. Long before the Royal Military College of Canada was established in 1876, there were proposals for military colleges in Canada. Staffed by British Regulars, adult male students underwent a three-month long military course at the School of Military Instruction in Toronto. Established by Militia General Order in 1864, the school enabled officers of militia or candidates for commission or promotion in the Militia to learn military duties, drill and discipline, to command a company at Battalion Drill, to drill a company at Company Drill, the internal economy of a company, and the duties of a company's officer. The school was retained at Confederation, in 1867. In 1868, Schools of cavalry and artillery instruction were formed in Toronto. In the 19th century, an extensive sewage system was built, and streets became illuminated with gas lighting as a regular service. Long-distance railway lines were constructed, including a route completed in 1854 linking Toronto with the Upper Great Lakes. The Grand Trunk Railway and the Northern Railway of Canada joined in the building of the first Union Station in downtown. The advent of the railway dramatically increased the numbers of immigrants arriving, commerce and industry, as had the Lake Ontario steamers and schooners entering port before. These enabled Toronto to become a major gateway linking the world to the interior of the North American continent. Toronto became the largest alcohol distillation (in particular, spirits) centre in North America; the Gooderham and Worts Distillery operations became the world's largest whiskey factory by the 1860s. A preserved section of this once dominant local industry remains in the Distillery District. The harbour allowed for sure access to grain and sugar imports used in processing. Expanding port and rail facilities brought in northern timber for export and imported Pennsylvania coal. Industry dominated the waterfront for the next 100 years. Initially a horse-drawn system, Toronto's streetcar system eventually transitioned to electric-powered streetcars in 1892. The city received new immigrant groups beginning in the late 19th century into the early 20th century, particularly Germans, French, Italians, and Jews from various parts of Eastern Europe. They were soon followed by Chinese, Russians, Poles, and immigrants from other Eastern European nations. As the Irish before them, many of these new migrants lived in overcrowded shanty-type slums, such as "the Ward" which was centred on Bay Street, now the heart of the country's financial district. Despite its fast-paced growth, by the 1920s, Toronto's population and economic importance in Canada remained second to the much longer established Montreal, Quebec. However, by 1934, the Toronto Stock Exchange had become the largest in the country. Following the Second World War, refugees from war-torn Europe and Chinese job-seekers arrived, as well as construction labourers, particularly from Italy and Portugal. Following the elimination of racially based immigration policies by the late 1960s, immigration began from all parts of the world. Toronto's population grew to more than one million in 1951 when large-scale suburbanization began, and doubled to two million by 1971. By the 1980s, Toronto had surpassed Montreal as Canada's most populous city and the chief economic hub. During this time, in part owing to the political uncertainty raised by the resurgence of the Quebec sovereignty movement, many national and multinational corporations moved their head offices from Montreal to Toronto and Western Canadian cities. In 1954, the City of Toronto and 12 surrounding municipalities were federated into a regional government known as Metropolitan Toronto. The postwar boom had resulted in rapid suburban development and it was believed that a coordinated land use strategy and shared services would provide greater efficiency for the region. The metropolitan government began to manage services that crossed municipal boundaries, including highways, police services, water and public transit. In that year, a half-century after the Great Fire of 1904, disaster struck the city again when Hurricane Hazel brought intense winds and flash flooding. In the Toronto area, 81 people were killed, nearly 1,900 families were left homeless, and the hurricane caused more than $25 million in damage. 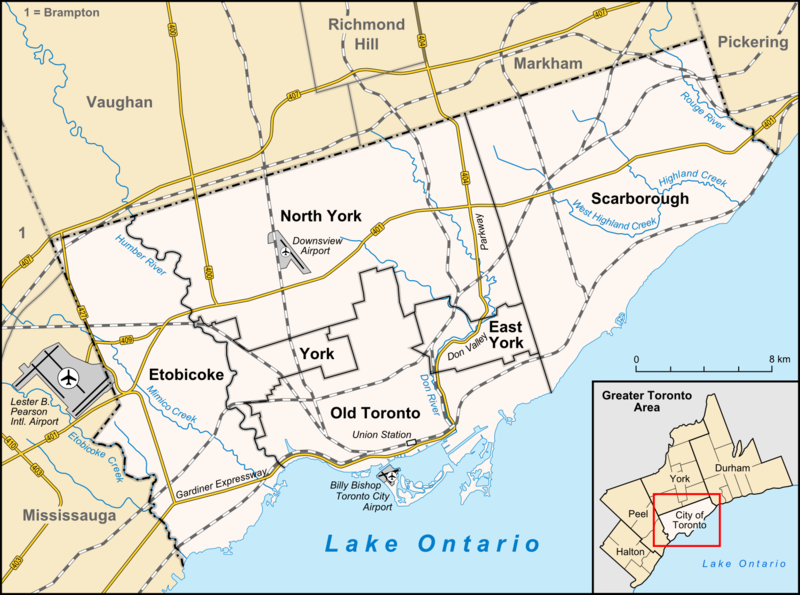 In 1967, the seven smallest municipalities of Metropolitan Toronto were merged with larger neighbours, resulting in a six-municipality configuration that included the former City of Toronto and the surrounding municipalities of East York, Etobicoke, North York, Scarborough, and York. In 1998, the Conservative provincial government led by Mike Harris dissolved the metropolitan government despite vigorous opposition from the component municipalities and overwhelming rejection in a municipal plebiscite. All six municipalities were amalgamated into a single municipality, creating the current City of Toronto, the successor of the old City of Toronto. North York mayor Mel Lastman became the first "megacity" mayor and the 62nd Mayor of Toronto. John Tory is the current mayor. The city attracted international attention in 2003 when it became the centre of a major SARS outbreak. Attempts to prevent the disease from spreading elsewhere dampened the local economy. On March 6, 2009, the city celebrated the 175th anniversary of its inception as the City of Toronto in 1834. Toronto hosted the 4th G20 summit during June 26–27, 2010. This included the largest security operation in Canadian history and, following large-scale protests and rioting, resulted in the largest mass arrest (more than a thousand people) in Canadian history. On July 8, 2013, severe flash flooding hit Toronto after an afternoon of slow moving, intense thunderstorms. Toronto Hydro estimated that 450,000 people were without power after the storm and Toronto Pearson International Airport reported that 126 mm (5 in) of rain had fallen over five hours, more than during Hurricane Hazel. Within six months, December 20, 2013, Toronto was brought to a halt by the worst ice storm in the city's history rivaling the severity of the 1998 Ice Storm. Toronto went on to host WorldPride in June 2014 and the Pan American Games in 2015. On April 23, 2018, there was a van attack that killed at least ten passersby in the North York City Centre within Toronto's northern district of North York. The city experiences four distinct seasons, with considerable variance in length. Some parts of the north and east of the city such as Scarborough and the suburbs, have a climate classified as humid continental climate (Köppen: Dfb). As a result of the rapid passage of weather systems (such as high- and low-pressure systems), the weather is variable from day to day in all seasons. Owing to urbanization and its proximity to water, Toronto has a fairly low diurnal temperature range. The denser urban scape makes for warmer nights year around; the average nighttime temperature is about 3.0 °C (5.40 °F) warmer in the city than in rural areas in all months. However, it can be noticeably cooler on many spring and early summer afternoons under the influence of a lake breeze since Lake Ontario is cool, relative to the air during these seasons. These lake breezes mostly occur in summer, bringing relief on hot days. Other low-scale maritime effects on the climate include lake-effect snow, fog, and delaying of spring- and fall-like conditions, known as seasonal lag. Skyline of Downtown Toronto from the Toronto Islands in 2017. Victorian-era Bay-and-gable houses are a distinct architectural style of residence that is ubiquitous throughout the older neighborhoods of Toronto. In an attempt to curb suburban sprawl, many suburban neighbourhoods in Toronto encouraged high density populations by mixing housing lots with apartment buildings far from the downtown core. Nathan Phillips Square is the city's main square. The square includes a reflecting pool that is converted into an ice rink during the winter. Large parks in the outer areas managed by the city include High Park, Humber Bay Park, Centennial Park, Downsview Park, Guild Park and Gardens, and Morningside Park. Toronto also operates several public golf courses. Most ravine lands and river bank floodplains in Toronto are public parklands. After Hurricane Hazel in 1954, construction of buildings on floodplains was outlawed, and private lands were bought for conservation. In 1999, Downsview Park, a former military base in North York, initiated an international design competition to realize its vision of creating Canada's first urban park. The winner, "Tree City", was announced in May 2000. Approximately 8,000 hectares (20,000 acres), or 12.5 percent of Toronto's land base is maintained parkland. Morningside Park is the largest park managed by the city, which is 241.46 hectares (597 acres) in size. Opened in 1907, the Royal Alexandra Theatre is the oldest continuously operating theatre in North America. Toronto is the third largest centre for English-language theatre, behind only London, and New York. Mural of the Toronto Maple Leafs, at College subway station. The Maple Leafs are a professional ice hockey club with the NHL. The Toronto Blue Jays host the Detroit Tigers at the Rogers Centre. Toronto's unemployment rate was 6.7% as of July 2016. According to the website Numbeo, Toronto's cost of living plus rent index was second highest in Canada (of 31 cities). The local purchasing power was the sixth lowest in Canada, mid-2017. The average monthly social assistance caseload for January to October 2014 was 92,771. The number of seniors living in poverty increased from 10.5% in 2011 to 12.1% in 2014. Toronto’s 2013 child poverty rate was 28.6%, the highest among large Canadian cities of 500,000 or more residents. View of Chinatown on Spadina Avenue. According to the 2016 census, more than half of the city's population belonged to a visible minority group. In 2011, the most commonly reported religion in Toronto was Christianity, adhered to by 54.1% of the population. A plurality, 28.2%, of the city's population was Catholic, followed by Protestants (11.9%), Christian Orthodox (4.3%), and members of other Christian denominations (9.7%). With the city's significant number of Methodist Christians, Toronto was historically referred to as the Methodist Rome. Map of Toronto's 44 municipal electoral wards. The City of Toronto had an approved operating budget of Template:CAD in 2017 and a 10-year capital budget and plan of Template:CAD. The city's revenues include subsidies from the Government of Canada and the Government of Ontario, 33% from property tax, 6% from the land transfer tax and the rest from other tax revenues and user fees. The City's largest operating expenditures are the Toronto Transit Commission at Template:CAD (19%), and the Toronto Police Service, Template:CAD (9%). Template:Update section The low crime rate in Toronto has resulted in the city having a reputation as one of the safest major cities in North America. For instance, in 2007, the homicide rate for Toronto was 3.3 per 100,000 people, compared with Atlanta (19.7), Boston (10.3), Los Angeles (10.0), New York City (6.3), Vancouver (3.1), and Montreal (2.6). Toronto's robbery rate also ranks low, with 207.1 robberies per 100,000 people, compared with Los Angeles (348.5), Vancouver (266.2), New York City (265.9), and Montreal (235.3). Toronto has a comparable rate of car theft to various U.S. cities, although it is not among the highest in Canada. Toronto's Discovery District is a centre of research in biomedicine. It is located on a 2.5-square-kilometre (620 acres) research park that is integrated into Toronto's downtown core. It is also home to the Medical and Related Sciences Centre (MaRS), which was created in 2000 to capitalize on the research and innovation strength of the Province of Ontario. Another institute is the McLaughlin Centre for Molecular Medicine (MCMM). ^ a b Benson, Denise. "Putting T-Dot on the Map". Eye Weekly. Archived from the original on November 30, 2007. https://web.archive.org/web/20071130000824/http://www.eye.net/eye/issue/issue_10.14.99/thebeat/extended.php. Retrieved December 5, 2006. ^ "Why is Toronto called 'Hogtown?'". funtrivia.com. http://www.funtrivia.com/askft/Question7148.html. ^ "City nicknames". got.net. http://got.net/~landauer/lists/CityOf.html. ^ Johnson, Jessica (August 4, 2007). "Quirky finds in the Big Smoke". The Globe and Mail. Archived from the original on April 16, 2008. https://web.archive.org/web/20080416095646/http://www.theglobeandmail.com/servlet/story/LAC.20070804.ATLAS04/TPStory/specialTravel. ^ "The real story of how Toronto got its name | Earth Sciences". September 18, 2007. Archived from the original on December 9, 2011. https://web.archive.org/web/20111209114921/http://geonames.nrcan.gc.ca/education/toronto_e.php. Retrieved February 10, 2012. ^ a b "(Code 3520005) Census Profile". 2016 census. Statistics Canada. 2017. http://www12.statcan.gc.ca/census-recensement/2016/dp-pd/prof/details/page.cfm?Lang=E&Geo1=CSD&Code1=3520005&Geo2=PR&Code2=35&Data=Count&SearchType=Begins&SearchPR=01&B1=All. Retrieved 2017-02-12. ^ a b "Population and dwelling counts, for population centres, 2011 and 2006 censuses". 2011 Census of Population. Statistics Canada. January 13, 2014. http://www12.statcan.gc.ca/census-recensement/2011/dp-pd/hlt-fst/pd-pl/Table-Tableau.cfm?LANG=Eng&T=801&PR=0&RPP=9999&SR=1&S=3&O=D. Retrieved December 11, 2014. ^ a b "Population and dwelling counts, for census metropolitan areas, 2011 and 2006 censuses". 2011 Census of Population. Statistics Canada. January 13, 2014. http://www12.statcan.gc.ca/census-recensement/2011/dp-pd/hlt-fst/pd-pl/Table-Tableau.cfm?LANG=Eng&T=205&S=3&RPP=50. Retrieved December 11, 2014. ^ a b "Global city GDP 2014". Brookings Institution. Archived from the original on June 4, 2013. https://www.webcitation.org/6H7Jql2A9?url=http://www.brookings.edu/research/interactives/global-metro-monitor-3. Retrieved November 18, 2014. ^ Robert Vipond (April 24, 2017). Making a Global City: How One Toronto School Embraced Diversity. University of Toronto Press. p. 147. ISBN 978-1-4426-2443-6. https://books.google.com/books?id=_p7CDgAAQBAJ&pg=PP147. ^ David P. Varady (February 2012). Desegregating the City: Ghettos, Enclaves, and Inequality. SUNY Press. p. 3. ISBN 978-0-7914-8328-2. https://books.google.com/books?id=uifwpL0qZ_EC&pg=PA3. ^ Ute Husken; Frank Neubert (November 7, 2011). Negotiating Rites. Oxford University Press. p. 163. ISBN 978-0-19-981230-1. https://books.google.com/books?id=WhtwAgAAQBAJ&pg=PA163. ^ "First Peoples, 9000 BCE to 1600 CE – The History of Toronto: An 11,000-Year Journey – Virtual Exhibits | City of Toronto". Archived from the original on April 16, 2015. https://web.archive.org/web/20150416111209/https://www1.toronto.ca/wps/portal/contentonly?vgnextoid=dd058d577e312410VgnVCM10000071d60f89RCRD. Retrieved April 30, 2015. ^ "The early history of York & Upper Canada". http://www.dalzielbarn.com/pages/TheBarn/York&UpperCanada.html. Retrieved July 14, 2015. ^ "The Battle of York, 200 years ago, shaped Toronto and Canada: Editorial". thestar.com. April 21, 2013. https://www.thestar.com/opinion/editorials/2013/04/21/the_battle_of_york_200_years_ago_shaped_toronto_and_canada_editorial.html. Retrieved July 14, 2015. ^ "Timeline: 180 years of Toronto history". Toronto. http://toronto.ctvnews.ca/timeline-180-years-of-toronto-history-1.1717785. ^ Citizenship and Immigration Canada (September 2006). "Canada-Ontario-Toronto Memorandum of Understanding on Immigration and Settlement (electronic version)". Archived from the original on March 11, 2007. https://web.archive.org/web/20070311043934/http://www.cic.gc.ca/english/policy/fed-prov/can-ont-toronto-mou.html. Retrieved March 1, 2007. ^ Flew, Janine; Humphries, Lynn; Press, Limelight; McPhee, Margaret (2004). The Children's Visual World Atlas. Sydney, Australia: Fog City Press. p. 76. ISBN 1-74089-317-4. ^ a b c d e f "Focus on Geography Series, 2016 Census: Toronto, City (CSD) – Ontario: Immigration and Ethnocultural diversity". Statistics Canada. http://www12.statcan.ca/census-recensement/2016/as-sa/fogs-spg/Facts-CSD-eng.cfm?TOPIC=7&LANG=eng&GK=CSD&GC=3520005. Retrieved October 31, 2017. ^ "Diversity – Toronto Facts – Your City. City of Toronto". Archived from the original on April 6, 2015. https://web.archive.org/web/20150406180836/http://www1.toronto.ca/wps/portal/contentonly?vgnextoid=dbe867b42d853410VgnVCM10000071d60f89RCRD&vgnextchannel=57a12cc817453410VgnVCM10000071d60f89RCRD. Retrieved April 2, 2015. ^ "Social Development, Finance & Administration". City of Toronto. Archived from the original on June 18, 2016. https://web.archive.org/web/20160618015141/http://www1.toronto.ca/city_of_toronto/social_development_finance__administration/files/pdf/language_2011_backgrounder.pdf. Retrieved June 7, 2016. ^ "Music – Key Industry Sectors – City of Toronto". Archived from the original on July 28, 2015. https://web.archive.org/web/20150728061830/https://www1.toronto.ca/wps/portal/contentonly?vgnextoid=28682dbb5cce2410VgnVCM10000071d60f89RCRD&vgnextchannel=401132d0b6d1e310VgnVCM10000071d60f89RCRD. Retrieved July 30, 2015. ^ "Quality of Life – Arts and Culture". http://www.investtoronto.ca/Quality-of-Life/Amenities/Cultural-Attractions.aspx. Retrieved July 30, 2015. ^ "Film & Television – Key Industry Sectors – City of Toronto". Archived from the original on July 28, 2015. https://web.archive.org/web/20150728061809/https://www1.toronto.ca/wps/portal/contentonly?vgnextoid=5e46c1b5c62ca310VgnVCM10000071d60f89RCRD&vgnextchannel=401132d0b6d1e310VgnVCM10000071d60f89RCRD. Retrieved July 30, 2015. ^ "Made here. Seen everywhere. – Film in Toronto – City of Toronto". Archived from the original on July 28, 2015. https://web.archive.org/web/20150728004358/https://www1.toronto.ca/wps/portal/contentonly?vgnextoid=f635ca7908040410VgnVCM10000071d60f89RCRD. Retrieved July 30, 2015. ^ "Ontario's Enertainment and Creative Cluster". http://www.mtc.gov.on.ca/en/publications/Creative_Cluster_Report.pdf. Retrieved July 3, 2015. ^ "Culture, The Creative City". http://torontopressroom.ets.net/culture-and-creativity.aspx. Retrieved July 10, 2015. ^ "Cultural Institutions in the Public Realm" (PDF). http://www.eraarch.ca/pdf/CulturalInstitutions.pdf. Retrieved June 7, 2016. ^ "Arts and Culture – Living In Toronto". City of Toronto. Archived from the original on May 4, 2015. https://web.archive.org/web/20150504095532/http://www1.toronto.ca/wps/portal/contentonly?vgnextoid=ecc92271635af310VgnVCM10000071d60f89RCRD. Retrieved April 30, 2015. ^ "Tourism". toronto.ca. City of Toronto. Archived from the original on May 14, 2015. https://web.archive.org/web/20150514203744/http://www1.toronto.ca/wps/portal/contentonly?vgnextoid=580b6fe8341da310VgnVCM10000071d60f89RCRD&vgnextchannel=401132d0b6d1e310VgnVCM10000071d60f89RCRD. ^ Melanson, Trevor. "What Toronto's skyline will look like in 2020". Canadian Business. http://www.canadianbusiness.com/blogs-and-comment/what-torontos-skyline-will-look-like-in-2020/. ^ Torontoist. "The CN Tower is Dead. Long Live The CN Tower!". torontoist.com. http://torontoist.com/2007/09/the_cn_tower_is/. ^ ICF Consulting (February 2000). "Toronto Competes". Archived from the original on January 27, 2007. https://web.archive.org/web/20070127122238/http://www.toronto.ca/business_publications/tocompetes.htm. Retrieved March 1, 2007. ^ "Business Toronto – Key Business Sectors". http://www.investtoronto.ca/Business-Toronto/Key-Business-Sectors.aspx. Retrieved April 30, 2015. ^ Myrvold & Fahey 1997. ^ "The real story of how Toronto got its name". Natural Resources Canada (2005). Archived from the original on October 16, 2006. https://web.archive.org/web/20061016222541/http://geonames.nrcan.gc.ca/education/toronto_e.php. Retrieved December 8, 2006. ^ Fort Rouillé Script error, Jarvis Collegiate Institute (2006). Retrieved December 8, 2006. ^ "History of Ontario's Legislative Buildings". Government of Ontario. Archived from the original on October 22, 2009. https://web.archive.org/web/20091022083250/http://www.ontario.ca/en/your_government/004690. Retrieved July 13, 2007. ^ "Welcome to the birthplace of Toronto". Friends of Fort York (2006). http://www.fortyork.ca. Retrieved December 8, 2006. ^ "Battle of York". Archived from the original on August 20, 2007. https://web.archive.org/web/20070820093114/http://www.udata.com/users/hsbaker/york.htm. Retrieved July 10, 2007. ^ Black history at the City of Toronto Archives Script error, City of Toronto (2009). Retrieved March 13, 2009. ^ "Slavery Abolition Act 1833 (repealed November 19, 1998)". UK Government. http://www.legislation.gov.uk/ukpga/Will4/3-4/73. Retrieved September 13, 2017. 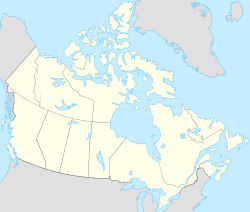 ^ "Canada Provinces". http://www.statoids.com/uca.html. Retrieved April 17, 2010. ^ "Province of Canada : Second Class Certificate" (JPG). http://freepages.genealogy.rootsweb.ancestry.com/~theislands/photos6/ansonkeillmilcert.jpg. Retrieved June 7, 2016. ^ a b Toronto transit chief says searches unlikely (2005). Retrieved February 3, 2007. ^ "Westward ho? The shifting geography of corporate power in Canada". 2002. http://www.findarticles.com/p/articles/mi_qa3683/is_200201/ai_n9069631/pg_1. Retrieved January 14, 2007. ^ "Municipality of Metropolitan Toronto Act". Government of Ontario. 2000. http://www.e-laws.gov.on.ca/html/repealedstatutes/english/elaws_rep_statutes_90m62_e.htm. Retrieved December 29, 2006. ^ "SOS! Canadian Disasters". Library and Archives Canada. 2006. http://www.collectionscanada.gc.ca/sos/002028-3200-e.html. Retrieved December 19, 2008. ^ Witten, David (2016). "Why is Toronto Called the Six". http://www.mathwizurd.com/history/2015/5/8/why-is-toronto-called-the-6. Retrieved June 2, 2017. ^ Laurance, Jeremy (April 23, 2003). "One family went on holiday – and made Toronto a global pariah". https://www.independent.co.uk/news/science/one-family-went-on-holiday-and-made-toronto-a-global-pariah-116428.html. ^ "More than 1,000 people detained during G20 summit in Toronto can sue police". The Guardian. Guardian News and Media Limited. https://www.theguardian.com/world/2016/apr/06/toronto-g20-summit-police-lawsuit-civil-rights-abuses. Retrieved July 15, 2016. ^ "Environment Canada answers the question: Where was Toronto's severe thunderstorm warning?". Global Toronto. July 9, 2013. http://globalnews.ca/news/704499/environment-canada-answers-the-question-where-was-torontos-severe-thunderstorm-warning/. Retrieved July 18, 2013. ^ "Showing off a world of Pride". Toronto Star. Toronto Star Newspapers Ltd.. https://www.thestar.com/news/pridetoronto/2014/06/29/world_pride_12000_marchers_turn_downtown_streets_into_sea_of_colour.html. Retrieved July 15, 2016. ^ "Official Site". TORONTO 2015 Pan Am / Parapan Am Games. http://www.toronto2015.org/. Retrieved July 15, 2016. ^ "Getting Here". City of Toronto. http://www.toronto.ca/attractions/getting_here.htm. Retrieved February 14, 2008. ^ "City of Toronto: Toronto Facts, Toronto's geography". City of Toronto. October 23, 2000. http://www.toronto.ca/toronto_facts/geography.htm. Retrieved December 6, 2009. ^ Longley, Richard (September 14, 2017). "Tempestuous isle: A tragic history of Toronto Islands" (in en-us). NOW Magazine. https://nowtoronto.com/news/tempestuous-isle/. ^ Peel, M. C. and Finlayson, B. L. and McMahon, T. A. (2007). "Updated world map of the Köppen–Geiger climate classification". Hydrol. Earth Syst. Sci. 11: 1633–1644. DOI:10.5194/hess-11-1633-2007. ISSN 1027-5606. ^ a b "What are we studying and why?". Toronto's Future Weather and Climate Driver Study. City of Toronto. 2011. Archived from the original on August 20, 2015. https://web.archive.org/web/20150820183936/http://www1.toronto.ca/city_of_toronto/environment_and_energy/key_priorities/files/pdf/tfwcds-chapter1.pdf. Retrieved September 20, 2015. ^ a b c d e "Why is Weather in Toronto the way it is?". Toronto's Future Weather and Climate Driver Study. City of Toronto. 2011. Archived from the original on August 20, 2015. https://web.archive.org/web/20150820183939/http://www1.toronto.ca/city_of_toronto/environment_and_energy/key_priorities/files/pdf/tfwcds-chapter3.pdf. Retrieved September 20, 2015. ^ a b c d e f "Weather Expectations". City of Toronto. Archived from the original on September 9, 2015. https://web.archive.org/web/20150909015931/http://www1.toronto.ca/wps/portal/contentonly?vgnextoid=0d14c76aa6b12310VgnVCM1000003dd60f89RCRD&vgnextchannel=a48832d0b6d1e310VgnVCM10000071d60f89RCRD. Retrieved September 20, 2015. ^ Service, Government of Canada, Natural Resources Canada, Canadian Forest. "Canada's Plant Hardiness Site". http://www.planthardiness.gc.ca/?m=22&lang=en&prov=Ontario&val=T. Retrieved June 7, 2016. ^ Service, Government of Canada, Agriculture and Agri-Food Canada. "Plant Hardiness Zones of Canada". http://www.agr.gc.ca/atlas/agpv?webmap-en=78529700717d4cab81c13e9f9404ef10&webmap-fr=c1b454842d3748b0bb0807d7817d34c2. Retrieved July 11, 2017. ^ "Toronto Architecture". Archived from the original on November 1, 2011. https://web.archive.org/web/20111101083629/http://www.where.ca/Toronto/article_feature~listing_id~95.htm. ^ Dubai building surpasses CN Tower in height, CTV Television Network (2007); retrieved September 13, 2007. ^ "CN Tower no longer world's tallest". Toronto Star. Toronto Star Newspapers Ltd.. https://www.thestar.com/news/gta/2007/09/13/cn_tower_no_longer_worlds_tallest.html. Retrieved July 16, 2016. ^ Most of these buildings are residential, whereas the central business district contains commercial office towers. There has been recent attention given for the need to retrofit many of these buildings, which were constructed beginning in the 1950s as residential apartment blocks to accommodate a quickly growing population. As of November 2011, the city had 132 high-rise buildings under construction. "Highrises? We're tops on the continent". Toronto Star. TheStar.com. October 5, 2011. "Some 132 tall buildings are currently rising in Toronto, by far the most in North America.". https://www.thestar.com/news/article/1064773-highrises-we-re-tops-on-the-continent. Retrieved April 18, 2014. ^ "Toronto's Cultural Renaissance". City of Toronto. 2005. http://www.livewithculture.ca/livewithculture_ca/about/cultural_renaissance_projects/toronto_s_cultural_renaissance. ^ "The Distillery Historic District". http://www.toronto.com/things-to-do/the-distillery-historic-district/. Retrieved July 16, 2016. ^ "History of Wychwood Park". Maple Tree Publishing. http://www.torontoneighbourhoods.net/neighbourhoods/midtown/wychwood-park/history. Retrieved July 16, 2016. ^ "Casa Loma". Liberty Entertainment Group. http://www.casaloma.org/. Retrieved July 16, 2016. ^ "Spadina Museum: Historic House & Gardens". City of Toronto. Archived from the original on July 4, 2016. https://web.archive.org/web/20160704082331/http://www1.toronto.ca/wps/portal/contentonly?vgnextoid=919d2271635af310VgnVCM10000071d60f89RCRD. Retrieved July 16, 2016. ^ Fox, Paul L. (March 12, 1953). "Plan town of 45,000 on Don Mills farms; Will cost 10,000,000". Toronto Star. ^ a b "Junction Stockyards". Toronto Historical Association. http://torontohistory.net/junction-stockyards.html. Retrieved September 13, 2017. ^ Flack, Derek (August 24, 2011). "What King West looked like in the 1980s". http://www.blogto.com/city/2011/08/what_king_west_looked_like_in_the_1980s/. ^ "Port Lands Acceleration Initiative – City Planning – Your City | City of Toronto" (in en-CA). Archived from the original on February 5, 2017. https://web.archive.org/web/20170205181727/http://www1.toronto.ca/wps/portal/contentonly?vgnextoid=6e75397250b16410VgnVCM10000071d60f89RCRD&vgnextchannel=ae9352cc66061410VgnVCM10000071d60f89RCRD. ^ "Ashbridge’s Bay" (in en-US). Leslieville Historical Society. April 13, 2015. https://leslievillehistory.com/timeline-ashbridges-bay/. ^ "City Announces Next Steps in Port Lands Revitalization | Urban Toronto" (in en). http://urbantoronto.ca/news/2015/07/city-announces-next-steps-port-lands-revitalization. ^ "East Harbour". First Gulf. http://eastharbour.ca/. Retrieved September 13, 2017. ^ "Urban Design: Cloud Garden Park". Lost Streams, Toronto, Web site. http://www.lostrivers.ca/points/cloudgrdnpk.htm. Retrieved March 27, 2009. ^ a b Armstrong, James; McAllister, Mark (April 5, 2013). "Toronto boasts thousands of hectares of parkland". Global News. http://globalnews.ca/news/459228/toronto-boasts-thousands-of-hectares-of-parkland/. Retrieved October 1, 2015. ^ "Ontario hands over last piece of land for Rouge National Urban Park, but skeptics remain". CBCNews. Canadian Broadcasting Corporation. October 22, 2017. http://www.cbc.ca/news/canada/toronto/rouge-urban-park-ontario-leases-farms-1.4365896. Retrieved March 7, 2018. ^ "Corporate History". http://www.imax.com/corporate/history/. Retrieved December 3, 2012. ^ "$100M revitalization plan for Ontario Place". Toronto Sun. http://www.torontosun.com/2014/07/31/ontario-place-revitalization-plans. Retrieved July 16, 2016. ^ "Film and Television Industry: 2011 Year in Review". City of Toronto. September 1, 2012. http://www.toronto.ca/legdocs/mmis/2012/ed/bgrd/backgroundfile-45805.pdf. ^ Scott, Vernon. "Toronto Now Called Hollywood of North". Sarasota Herald-Tribune. https://news.google.com/newspapers?id=DkUfAAAAIBAJ&sjid=mmcEAAAAIBAJ&dq=toronto%20hollywood%20north&pg=4458%2C1049685. Retrieved June 10, 2011. ^ "New numbers confirm Toronto's rank as Hollywood North". City of Toronto. http://wx.toronto.ca/inter/it/newsrel.nsf/0/a196b48a551afa4285256df600461208?OpenDocument. Retrieved January 1, 2007. ^ "SARS costs for 'Hollywood North' and more". CBC News. March 9, 2004. Archived from the original on March 30, 2008. https://web.archive.org/web/20080330145114/http://www.torontoisms.com/guide/crime.htm. Retrieved January 1, 2007. ^ "The Caribana success story". Toronto Star. May 3, 2010. https://www.thestar.com/opinion/editorials/article/803506. Retrieved June 1, 2010. ^ Media Job Search Canada Script error Media Job Search Canada (2003). Retrieved May 8, 2007. ^ "About the Toronto Zoo". Toronto Zoo. Archived from the original on September 11, 2007. https://web.archive.org/web/20070911054227/http://www.torontozoo.com/AboutTheZoo/. Retrieved October 11, 2007. ^ Buhasz, Laszlo (May 7, 2003). "Uncaging the zoo". Globe and Mail (Toronto). Archived from the original on April 11, 2008. https://web.archive.org/web/20080411144754/http://www.theglobeandmail.com/servlet/story/LAC.20030507.TRCOVE7/TPStory/Travel. Retrieved October 11, 2007. ^ "CNE – About Us"]. Canadian National Exhibition. 2006. http://www.cnedirect.com/contact-us/. Retrieved December 29, 2006. ^ City of Toronto (2007). "Who uses the square (Demographics)"]. http://www.ydsquare.ca/index.php?option=com_content&task=view&id=22&Itemid=27. Retrieved April 12, 2008. ^ "Welcome to the Taste of the Danforth". Archived from the original on April 1, 2007. https://web.archive.org/web/20070401235730/http://www.tasteofthedanforth.com/6history.html. Retrieved July 7, 2007. ^ "Equalizer Soccer – USL W-League, once top flight, folds after 21 seasons". http://equalizersoccer.com/2015/11/06/usl-w-league-folds-21-seasons/. Retrieved June 7, 2016. ^ "Toronto to host 2016 All Star Game". AllStarweekendToronto. http://www.allstarweekendtoronto.com/. Retrieved February 13, 2016. ^ W., T.A. (March 8, 2017). "Rugby league’s Toronto Wolfpack are the first transatlantic sports team". https://www.economist.com/blogs/gametheory/2017/03/crossing-pond. Retrieved March 12, 2017. ^ Hall, Joseph (October 30, 2015). "Toronto Rush takes flight with American Ultimate Disc League". The Star. https://www.thestar.com/sports/localsports/article/1292212--american-ultimate-disc-league-gets-toronto-franchise. Retrieved October 30, 2015. ^ "American Ultimate Disc League". http://theaudl.com/. Retrieved October 30, 2015. ^ "History of the TUC". http://tuc.org/history/tuc. Retrieved October 30, 2015. ^ "Toronto 2015 Pan American Games Bid Officially Launched". Archived from the original on October 19, 2008. https://web.archive.org/web/20081019025828/http://www.gamesbids.com/eng/commonwealth_games_bids/1216133774.html. ^ Cayley, Shawn (August 12, 2014). "Countdown is on to Pan American and Parapan American Games in Durham Region". durhamregion.com (Metroland Media Group). http://www.durhamregion.com/news-story/4754402-countdown-is-on-to-pan-american-and-parapan-american-games-in-durham-region/. Retrieved August 31, 2014. ^ Byers, Jim (July 10, 2007). "Third time lucky for T.O. Games bid?, TheStar.com, 2007". The Star (Toronto). https://www.thestar.com/News/article/234164. Retrieved May 25, 2010. ^ Market Statistics Script error Toronto Stock Exchange (2006). Retrieved May 11, 2007. ^ "EI Economic Region of Toronto". Government of Canada. http://srv129.services.gc.ca/ei_regions/eng/toronto.aspx?rates=1. Retrieved July 16, 2016. ^ "Cost of Living in Canada". http://www.numbeo.com/cost-of-living/country_result.jsp?country=Canada. Retrieved November 4, 2017. ^ "America: Cost of Living Index by City 2017 Mid-Year". https://www.numbeo.com/cost-of-living/region_rankings.jsp?title=2017-mid&region=019. Retrieved November 4, 2017. ^ "Are We Making Any Progress In Reducing Poverty In Toronto?". http://torontosvitalsigns.ca/main-sections/gap-between-rich-and-poor/. Retrieved September 27, 2017. ^ a b c d e "Census Profile, 2016 Census: Toronto, City [Census subdivision, Ontario and Canada [Country]"]. Statistics Canada. http://www12.statcan.ca/census-recensement/2016/dp-pd/prof/details/page.cfm?Lang=E&Geo1=CSD&Code1=3520005&Geo2=PR&Code2=01&Data=Count&SearchText=3520005&SearchType=Begins&SearchPR=01&B1=All&Custom=&TABID=3. Retrieved October 31, 2017. ^ a b Francine Kopun; Nicholas Keung (December 5, 2007). "A city of unmatched diversity". Toronto Star. https://www.thestar.com/News/GTA/article/282694. Retrieved October 7, 2008. ^ "A few frank words about immigration". The Globe and Mail. October 7, 2010. https://www.theglobeandmail.com/news/national/time-to-lead/multiculturalism/a-few-frank-words-about-immigration/article1746816. Retrieved February 8, 2014. ^ a b "National Household Survey (NHS) Profile, 2011". Government of Canada. http://www12.statcan.gc.ca/nhs-enm/2011/dp-pd/prof/details/page.cfm?Lang=E&Geo1=CSD&Code1=3520005&Data=Count&SearchText=Toronto&SearchType=Begins&SearchPR=01&A1=All&B1=All&GeoLevel=PR&GeoCode=3520005&TABID=1. Retrieved April 18, 2014. ^ "Toronto in Transition: Demographic Change in the Late Twentieth Century Script error". (PDF). CERIS – The Ontario Metropolis Centre. ^ Javed, Noor (March 10, 2010). "Visible Minority Will Mean White by 2013". Toronto Star. https://www.thestar.com/news/gta/article/777547--visible-minority-will-mean-white-by-2031. ^ Toronto Visible Minorities (Map). 2013. http://neoformix.com/Projects/DotMaps/TorontoVisMin.html. Retrieved September 12, 2015. ^ Worron, Trish (November 1, 2002). "The way we were in Toronto in 1892". Toronto Star. ^ "Francophones in Ontario – 2011 Census Data". Government of Ontario – Ministry of Francophone Affairs. June 13, 2014. http://www.ofa.gov.on.ca/en/franco-stats.html. Retrieved November 25, 2015. ^ "Focus on Geography Series, 2011 Census – Language". Statistics Canada. April 17, 2014. http://www12.statcan.gc.ca/census-recensement/2011/as-sa/fogs-spg/Facts-csd-eng.cfm?Lang=Eng&GK=CSD&GC=3520005. Retrieved November 25, 2015. ^ "9-1-1 = EMERGENCY in any language". City of Toronto. Archived from the original on October 28, 2014. https://web.archive.org/web/20141028143249/http://www1.toronto.ca/wps/portal/contentonly?vgnextoid=4e142140f1c8f310VgnVCM10000071d60f89RCRD&vgnextchannel=163307ceb6f8e310VgnVCM10000071d60f89RCRD. Retrieved January 5, 2007. ^ "Council Members". City of Toronto. Archived from the original on July 15, 2016. https://web.archive.org/web/20160715180346/http://www1.toronto.ca/wps/portal/contentonly?vgnextoid=c3a83293dc3ef310VgnVCM10000071d60f89RCRD. Retrieved July 17, 2016. ^ "'Taking the keys' from Mayor Rob Ford: How Toronto councillors voted". thestar.com. November 18, 2013. https://www.thestar.com/news/city_hall/2013/11/18/taking_the_keys_from_mayor_rob_ford_how_toronto_councillors_voted.html. ^ a b "Toronto City Council and Committees". City of Toronto. http://app.toronto.ca/tmmis/decisionBodyList.do?function=prepareDisplayDBList. Retrieved July 17, 2016. ^ "Directory of committees, task forces and round tables". City of Toronto. http://www.toronto.ca/committees/directory.htm. Retrieved March 18, 2007. ^ "Overview – City Budget – Budget & Finances". City of Toronto. Archived from the original on September 14, 2017. https://web.archive.org/web/20170914034827/https://www1.toronto.ca/wps/portal/contentonly?vgnextoid=bf2cf02ab1208510VgnVCM10000071d60f89RCRD. Retrieved September 13, 2017. ^ a b "Budget 2017 Charts". City of Toronto. Archived from the original on July 26, 2017. https://web.archive.org/web/20170726105036/https://www1.toronto.ca/City%20Of%20Toronto/Strategic%20Communications/City%20Budget/2017/PDFs/Where%20the%20money%20goes%202017%20CA.pdf. Retrieved September 13, 2017. ^ a b Statistics Canada; The Daily (July 21, 2006). "Crime statistics". Archived from the original on October 24, 2008. https://web.archive.org/web/20081024034909/http://www.statcan.ca/Daily/English/050721/d050721a.htm. Retrieved March 5, 2007. ^ "Crime and Safety". Archived from the original on March 30, 2008. https://web.archive.org/web/20080330145114/http://www.torontoisms.com/guide/crime.htm. ^ a b "Despite rise, police say T.O. murder rate 'low'". December 26, 2007. http://www.ctv.ca/servlet/ArticleNews/story/CTVNews/20071226/toronto_murderrate_071226/20071226?hub=TopStories. Retrieved April 17, 2010. ^ "FBI statistics 2008". Archived from the original on April 12, 2010. https://web.archive.org/web/20100412045124/http://www.fbi.gov/ucr/08aprelim/table_4.html. Retrieved April 17, 2010. ^ Topping, David (July 22, 2008). "Metrocide: A History of Violence". http://torontoist.com/2008/07/metrocide_historical_homicides.php. Retrieved April 17, 2010. ^ "Story – News". Vancouver Sun. Canada. March 15, 2009. Archived from the original on April 18, 2009. https://web.archive.org/web/20090418193156/http://www.vancouversun.com/news/Vancouver%2Bmurder%2Brate%2BNorth%2BAmerican%2Bstandards/1494291/story.html. Retrieved April 17, 2010. ^ "Bilan chiffres_A_new" (PDF). http://www.spvm.qc.ca/upload/documentations/Bilan_chiffres_Anglais.pdf. Retrieved April 17, 2010. ^ "Vancouver.ca" (PDF). Archived from the original on June 23, 2010. https://www.webcitation.org/5qh4Zlfk0?url=http://vancouver.ca/police/Planning/StatsDistrict/2007/20022007AnnualSummary.pdf. Retrieved April 17, 2010. ^ "2007annrep_draft_daily_2008_03_26.xlsm" (PDF). http://www.torontopolice.on.ca/publications/files/reports/2007statsreport.pdf. Retrieved April 17, 2010. ^ "GunControl.ca" (PDF). Archived from the original on October 17, 2010. https://www.webcitation.org/5tYeuI09Y?url=http://www.guncontrol.ca/English/Home/Works/gangsandguns.pdf. Retrieved October 17, 2010. ^ "Double murder occurred on Christmas Day: police". December 27, 2007. http://www.ctv.ca/servlet/ArticleNews/story/CTVNews/20071227/double_murder_071227?s_name=&no_ads=. Retrieved April 17, 2010. ^ "CTV Toronto – Toronto sets a new record for gun-related carnage – CTV News, Shows and Sports – Canadian Television". Archived from the original on December 27, 2009. https://web.archive.org/web/20091227130849/http://toronto.ctv.ca/servlet/an/local/CTVNews/20051227/homicide_year_051227/20051227?hub=TorontoHome. Retrieved April 17, 2010. ^ "Gun crime in Metro Vancouver highest per capita in Canada". Archived from the original on February 14, 2009. https://web.archive.org/web/20090214043459/http://www2.canada.com/vancouversun/news/story.html?k=19079&id=4b651ab1-e729-44a9-86d3-79a1ddc84689. ^ "Ministry of the Attorney General – Backgrounder". October 25, 2005. http://www.attorneygeneral.jus.gov.on.ca/english/news/2005/20051025-gunviolence-bg.asp. Retrieved April 17, 2010. ^ Doucette, Chris (December 31, 2011). "Toronto murder rate plummets in 2011". Toronto Sun. http://www.torontosun.com/2011/12/31/toronto-murder-rate-plummets-in-2011. Retrieved February 18, 2012. ^ "TPS Crime Statistics – Year to Date Shootings & Homicides". Toronto Police Service. November 23, 2015. Archived from the original on November 26, 2015. https://web.archive.org/web/20151126002330/http://www.torontopolice.on.ca/statistics/ytd_stats.php. ^ "About Us". Toronto District School Board. http://www.tdsb.on.ca/AboutUs.aspx. ^ "Key Facts: Media". Toronto Public Library. http://www.torontopubliclibrary.ca/media/key-facts/. Retrieved October 17, 2010. ^ "Scarborough Civic Centre Branch: Hours & Locations: Toronto Public Library". http://www.torontopubliclibrary.ca/renovations/scarborough-centre-branch.jsp. Retrieved September 5, 2015. ^ a b c d "Study sheds light on ER wait times in Ontario". Canadian Broadcasting Corporation. January 25, 2007. Archived from the original on December 11, 2008. https://web.archive.org/web/20081211152931/http://www.cbc.ca/canada/toronto/story/2007/01/25/er-waits.html. Retrieved April 17, 2010. ^ Toronto Discovery District FAQ Script error, Toronto Discovery District (2006). Retrieved December 5, 2006. ^ "Medical and Related Sciences Centre". Medical and Related Sciences Centre. 2006. http://www.marsdd.com/. Retrieved December 5, 2006. ^ "McLaughlin Centre for Molecular Medicine (MCMM)". 2006. http://www.mclaughlin.utoronto.ca/Page4.aspx. Retrieved December 5, 2006. ^ "Metrolinx Eglinton Crosstown LRT". http://www.metrolinx.com/en/projectsandprograms/transitexpansionprojects/crosstown.aspx. Retrieved May 1, 2015. ^ "More Transit for Toronto | Crosstown". http://www.thecrosstown.ca/. Retrieved May 1, 2015. ^ "Ontario Moving Forward with Finch West Light Rail Transit Project". http://news.ontario.ca/mto/en/2015/04/ontario-moving-forward-with-finch-west-light-rail-transit-project.html. Retrieved May 1, 2015. ^ "Info to GO" (PDF). Archived from the original on March 6, 2012. https://web.archive.org/web/20120306013516/http://www.gotransit.com/public/en/docs/publications/Info%20To%20GO_2011.pdf. Retrieved May 24, 2011. ^ Lewington, Jennifer; McLeod, Lori (November 2007). "Underground mall in store for Union Station makeover". Globe and Mail (Toronto). https://www.theglobeandmail.com/news/national/underground-mall-in-store-for-union-station-makeover/article698642/. Retrieved November 3, 2015. ^ "Metrolinx Regional Express Rail". Metrolinx. http://www.metrolinx.com/en/regionalplanning/rer/. Retrieved May 1, 2015. ^ Maier, Hanna (October 9, 2007). ﻿Long-Life Concrete Pavements in Europe and Canada﻿ (Report). Federal Highway Administration. http://international.fhwa.dot.gov/pubs/pl07027/llcp_07_02.cfm. Retrieved May 1, 2010. "The key high-volume highways in Ontario are the 400-series highways in the southern part of the province. The most important of these is the 401, the busiest highway in North America, with average annual daily traffic (AADT) of more than 425,000 vehicles in 2004, and daily traffic sometimes exceeding 500,000 vehicles." ^ "Ontario government investing $401 million to upgrade Highway 401". Ontario Ministry of Transportation. August 6, 2002. Archived from the original on September 14, 2007. https://web.archive.org/web/20070914064434/http://ogov.newswire.ca/ontario/GPOE/2002/08/06/c0057.html?lmatch=&lang=_e.html. Retrieved March 18, 2007. "Highway 401 is one of the busiest highways in the world and represents a vital link in Ontario's transportation infrastructure, carrying more than 400,000 vehicles per day through Toronto." ^ Brian Gray (April 10, 2004). "GTA Economy Dinged by Every Crash on the 401 – North America's Busiest Freeway". Toronto Sun, transcribed at Urban Planet. http://www.urbanplanet.org/forums/index.php?showtopic=3459. Retrieved March 18, 2007. "The "phenomenal" number of vehicles on Hwy. 401 as it cuts through Toronto makes it the busiest freeway in the world..."
^ "TomTom Congestion Index: North America". https://www.tomtom.com/en_gb/trafficindex/list?citySize=LARGE&continent=NA&country=ALL. Retrieved September 13, 2017. ^ a b "International Alliance Program". City of Toronto. Archived from the original on 2012-08-04. https://www.webcitation.org/69f278Dpf?url=http://www.toronto.ca/invest-in-toronto/international-alliance-program.htm. Retrieved 2013-06-16. ^ "Lisboa – Geminações de Cidades e Vilas" (in Portuguese). Associação Nacional de Municípios Portugueses [National Association of Portuguese Municipalities]. http://www.anmp.pt/anmp/pro/mun1/gem101l0.php?cod_ent=M1100. Retrieved August 23, 2013. ^ "Acordos de Geminação, de Cooperação e/ou Amizade da Cidade de Lisboa" (in Portuguese). Camara Municipal de Lisboa. Archived from the original on October 31, 2013. https://web.archive.org/web/20131031202617/http://www.cm-lisboa.pt/municipio/relacoes-internacionais. Retrieved August 23, 2013. ^ "Pesquisa de Legislação Municipal – No 14471" (in Portuguese). Prefeitura da Cidade de São Paulo [Municipality of the City of São Paulo]. Archived from the original on October 18, 2011. https://web.archive.org/web/20111018123138/http://www3.prefeitura.sp.gov.br/cadlem/secretarias/negocios_juridicos/cadlem/integra.asp?alt=11072007L%20144710000. Retrieved August 23, 2013. Dinnie, Keith (2011). City Branding: Theory and Cases. Palgrave Macmillan. ISBN 978-0-230-24185-5. https://books.google.com/books?id=dW69d3qY9h8C&pg=PA21. Duffy, Hazel (2004). Competitive Cities: Succeeding in the Global Economy. Taylor & Francis. ISBN 978-0-203-36231-0. https://books.google.com/books?id=Y9wIBVb8Q9AC&pg=PA154. Gibson, Sally (2008). Toronto's Distillery District: history by the lake. Cityscape Holdings Inc. and Dundee Distillery District (GP) Commercial Inc.. ISBN 978-0-9809905-0-8. Williamson, R. F., ed (2008). Toronto: An Illustrated History of its First 12,000 Years. Toronto, Ontario: James Lorimer. Akler, Howard; Hood, Sarah (2003). Toronto: The Unknown City. Arsenal Pulp Press. ISBN 1-55152-146-6. https://books.google.com/books?id=9INeDSqwJ1MC&lpg=PA1&dq=Toronto&pg=PA1#v=onepage&q&f=true. Careless, J.M.S.. "Toronto". The Canadian Encyclopedia. Historica Foundation of Canada. Archived from the original on January 3, 2006. https://web.archive.org/web/20060103123419/http://www.thecanadianencyclopedia.com/index.cfm?PgNm=TCE&Params=A1ARTA0008050. Retrieved December 3, 2005. Careless, J. M. S (1984). Toronto to 1918: An Illustrated History. J. Lorimer and National Museum of Man. ISBN 0-88862-665-7. https://books.google.com/books?id=7V5-PlPhwnAC&lpg=PP1&dq=Toronto&pg=PP1#v=onepage&q&f=true. "Ultimate Inline Skating Guide to Toronto v1.5" (Google Earth). 2007. https://maps.google.com/maps/ms?ie=UTF8&hl=en&msa=0&output=nl&msid=105047441964785653381.0000011358da39f6cf7dd. Retrieved July 7, 2007. Filey, Mike (2008). Toronto: the way we were. Dundurn Press. ISBN 978-1-55002-842-3. https://books.google.com/books?id=ToQcKz0DFM4C&lpg=PP1&dq=Toronto&pg=PP1#v=onepage&q&f=true. Harris, Richard (October 7, 1999). Unplanned Suburbs: Toronto's American Tragedy, 1900 to 1950. JHU Press. ISBN 978-0-8018-6282-3. https://books.google.com/books?id=EF2uN3v0i9gC. Rayburn, Alan (2001). Naming Canada: stories about Canadian place names (2nd ed.). Toronto: University of Toronto Press. ISBN 0-8020-8293-9. https://books.google.com/books?id=aiUZMOypNB4C&lpg=PP1&dq=Naming%20Canada%3A%20stories%20about%20Canadian%20place%20names&pg=PP1#v=onepage&q&f=true. Statistics Canada (2003). "Toronto". Statistics Canada. 2002. 2001 Community Profiles.. Statistics Canada Catalogue no. 93F0053XIE. http://www12.statcan.ca/english/profil01/CP01/Details/Page.cfm?Lang=E&Geo1=CSD&Code1=3520005&Geo2=PR&Code2=35&Data=Count&SearchText=toronto&SearchType=Begins&SearchPR=01&B1=All&Custom=. Retrieved December 3, 2005. City of Toronto. "Toronto's Economic Profile". City of Toronto. Archived from the original on June 19, 2006. https://web.archive.org/web/20060619141654/http://www.toronto.ca/economic_profile/index.htm. Retrieved May 30, 2006. Whitzman, Carolyn (2009). Suburb, slum, urban village: transformations in Toronto's Parkdale neighbourhood, 1875–2002. UBC Press. ISBN 978-0-7748-1535-2. https://books.google.com/books?id=dcyQvnb0EiEC. This page uses content from the English language Wikipedia. The original content was at Toronto. The list of authors can be seen in the page history. As with this Familypedia wiki, the content of Wikipedia is available under the Creative Commons License.